Some people are tough to shop for, but not to worry because the COLOURlovers gift guide has a little something for everyone. This guide is full of colorful ideas from our favorite stores as well as some wonderful DIY projects that are so darn easy to do for that person that deserves something special. Check out the gifts below, and if you want even more ideas, make sure to check out our curated Gift Guide on Pinterest. We have lots of goodies over there too. So here we go! For The Cooks: For that aspring chef in your life here are a few things that will brighten up their kitchen and spirits as they spend their days making magic in the kitchen. The bowls are perfect for serving and a hand-held blender is great for the friend that makes mashed potatoes or protein shakes and doesn't want the hassle of all the clean up. If you want to go the extra mile, consider getting a recipe book and filling it with your favorite family recipes and collect favorite recipes from family and friends. 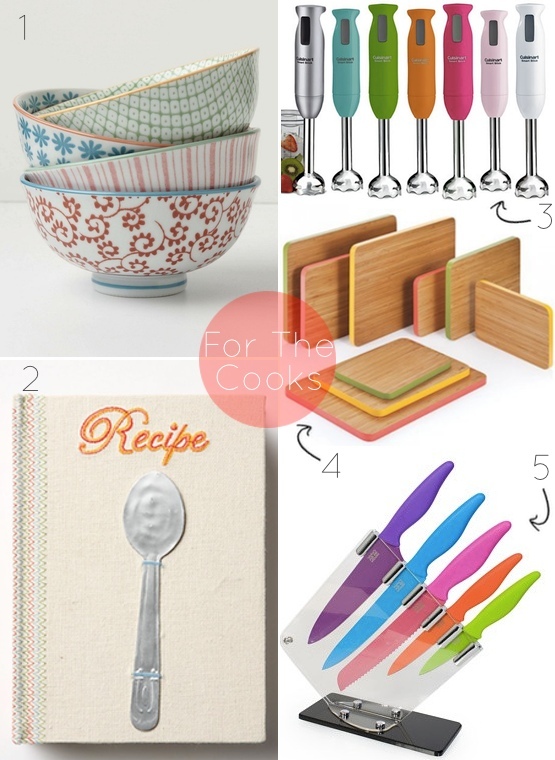 These gifts are sure to be a hit for that lovely cook. 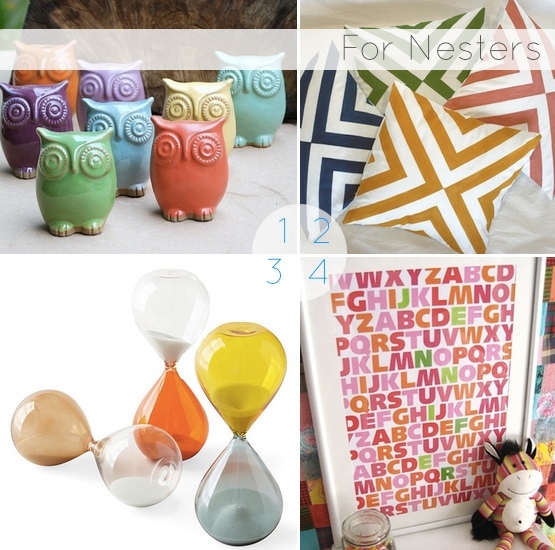 For The Nesters: Finding a unique and colorful piece to brighten up the home is always a good route to go for the friend who just moved or the couple who just married. The perfect pieces can add a little hint of color in the right spots and will be a staple in their home for years to come. Made By Girl offers custom colorful prints so you can add a last name to be hung in the living room or a baby's name for the nursery. Either way this gift will be a thoughtful addition to any home. For The Men: Oh the men. Us ladies can all agree for shopping for men isn't the easiest of tasks. So here are a few colorful and unique items that will get them excited. Let's highlight "The Present" a brand new clock that takes a full year to complete. The purpose and thought behind this idea is very interesting and worth checking out. Other items include a Tattly box, filled with faux tattoos, and a Tokyo Flash watch. It is worth giving honorable mention to a gift that is just as awesome, but a little different. 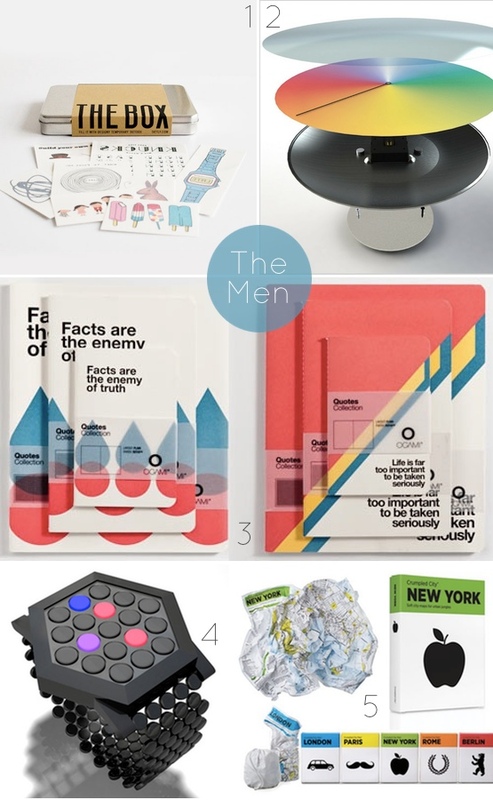 Quarterly.co offers unique packages curated and sent by top designers and influencers. If your guy wants a little inspiration, this is a great way to go. For the Crafter: For that creative person in your life, consider an easy DIY project that will make all the difference to them. 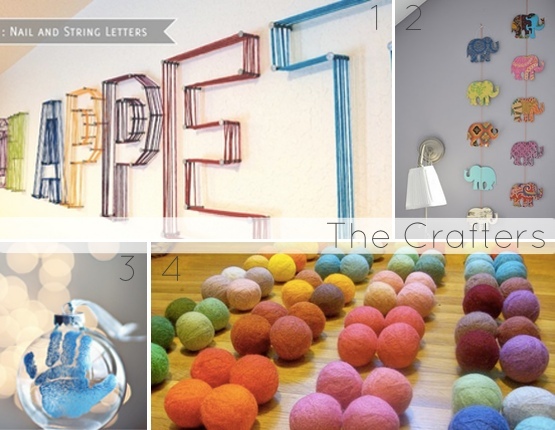 Yarn Letters, Wall Art, or a DIY holiday ornament are great suggestions that will add something special to their collection of goodies. And the best part is, they will keep your gift for years to come and always remember where it came from. For the Gals: I chose a few great ideas for any girl, but of course the list could go on and on, couldn't it? Colourful headbands or some statement bangles will be well-received by that special gal in your life. Last but not least are a pair of sparkly shoe clips that she can add to any pair of shoes to give it that extra special something. The Tech Snob: Yeah, you know who I'm talking about. There's always that one person on your list who has to get anything techy the moment it becomes available. So what does someone like this always need? Something to organize, show off and/or protect their investments. Who couldn't use a cable organizing system? They come in a variety of colors so go loud, muted or plain white for the extreme minimalist if need be. A simple, yet affordable gift or stocking stuffer. Anyone in love with their iDevice would be amped to receive something to utilize it even further by enabling it to show off their photo gallery as a slideshow, movies and even streaming content. 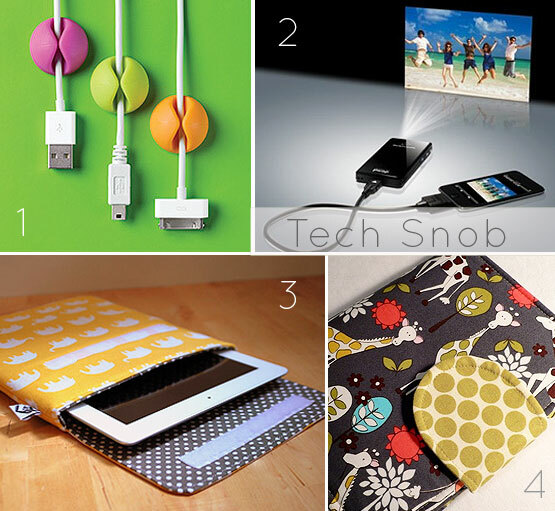 Lastly, Etsy is chock full of sleeves, cases and covers for almost any tech device at decent prices and many amazing colors and pattern schemes to choose from. Finally, if you're trying to find that super unique gift for the computer user and music lover on your list, check out a mugo player. 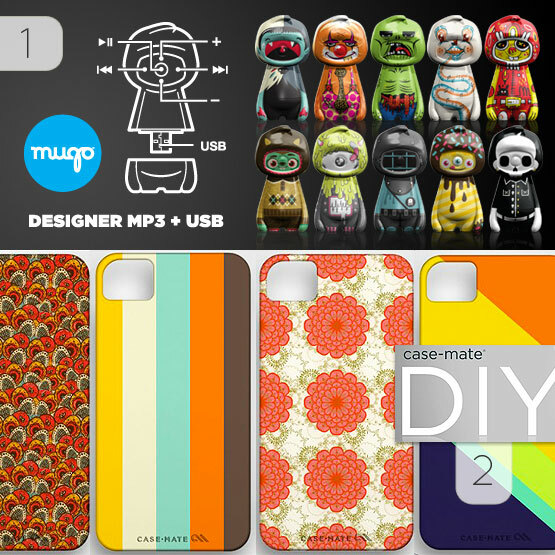 These super funky designer dual MP3 & USB characters will be a fast favorite! Mugo gave us an exclusive COLOURlovers 25% Discount Code to be used at checkout, good until December 31st, 2011. Every techy of course has one of the latest smartphones on the market, so spruce up their rig with your own handmade pattern or palette you designed on COLOURlovers with the case-mate DIY (image uploader). DIY cases available for: iPhone 4/4S, 3G/3GS, Samsung Galaxy S Vibrant, iPod Touch 4G and Blackberry Bold 9900. Case-mate gave us one (1) code for a FREE DIY case! How to earn this: Post in the comments what your most ideal colorful gift is for yourself. You may post more than one, but must at least be one or you will not be considered. Random selection will pick the winner. Contest ends: December 12th, 2011 at 11pm PST. oh my! really lovely Penina! Wow! I love everything on here! Especially the cook ideas. The binding on the cookbook gives me such inspiration. . . Even, for example, @warriorliz, you could post one of the other bowls featured on anthropologie page. Hope that helps and is clear for you two and everyone else placing submissions. Have fun! Excited to see what kind of things COLOURlovers find out there. Loving the FASHIONARY SIBLING @Dupsie - and quite colorful! No problem! :) Just making sure in case you were - you still had the opportunity. Wasn't really trying to enter the contest, just perusing the lovely items. Oh, I've been wanting one of those stick blenders to go with my new, healthier lifestyle. :-) Now I just have to decide on green or silver. My colorful gift would be new bedding for my master. I'm tired of the black, white and hot pink. I want something more vibrant in my room. Do you have an inspirational link/image online that you could portray this idea on here for the rest of us to better visualize it? Awesome that you like those in the post. It's fun that a lot of non-traditional product lines are becoming so much more colorful. Love the DIY Letters. So many possibilities for every room! I also could really use the Cable/Cord clips to help get the mess tidied up. Thanks for the links that you share. I would love to have a Casemate for my iPhone 4. @Zazlandia wow your friend has some AMAZINGLY colorful work. Is she on COLOURlovers? When you're on the image, click SHARE, then click "Grab the HTML/BB Code"
Love this light from Urban Outfitters!